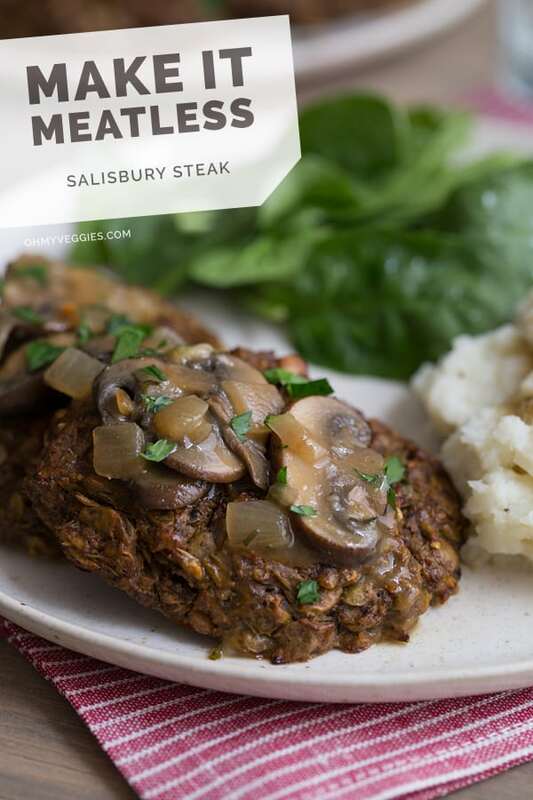 Vegetarian Salisbury Steak Recipe from Oh My Veggies! For the past month and a half, we’ve been having Salisbury Steak once a week for dinner. I wanted this recipe to be perfect, so every week, I’d make it in a slightly different way. With oats, without. With ketchup, without. Pan-fried or baked. It was like March Madness all up in my kitchen, except the brackets were made up entirely of vegetarian Salisbury Steaks. I’m betting my money on savory deliciousness! My mom never made Salisbury Steak when I was a kid, but I loved it in TV dinners and hot lunches at school, on the rare occasion I’d get them. (I think the congealed gravy was my favorite part–I mean, it must have been, because the meat had the texture of an old sponge.) Salisbury Steaks are traditionally cooked in that gravy; you cook the steaks, take them out of the pan, make the gravy, then put the steaks back in the pan to let them soak it up a little bit. After a lot of experimentation, I realized that this didn’t work for my vegetarian Salisbury Steaks–they soak up too much of the gravy, get mushy, and fall apart. So instead, I baked the steaks in the oven, whip up the gravy while they’re baking, and then spoon the gravy on top. These steaks are made with my little trifecta of mushrooms, lentils, and oats. This is the same combination I use my my Lentil Mushroom Meatballs and Lentil Mushroom Burgers. I tried a few other ingredients in this recipe, but settled on those three because they just work! 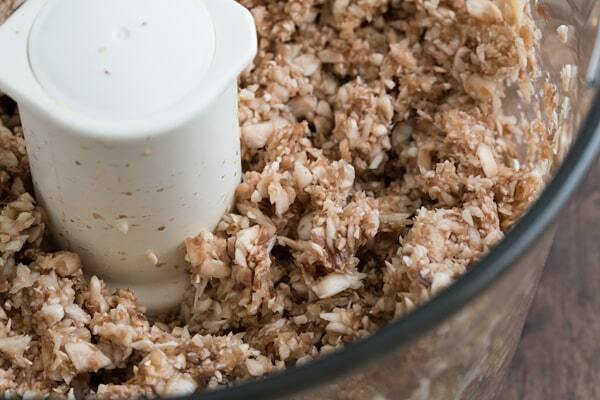 The mushrooms are pulsed in a food processor until finely chopped–you don’t want a puree, but you want it to have almost the consistency of crumbled ground beef. Thyme and sage, ketchup, tamari, and vegetarian Worcestershire sauce add lots of flavor to the faux-beef mixture. Because there’s extra gravy, you’ll want to serve this recipe with mashed potatoes or cauliflower on the side. We rounded things up with a simple spinach salad too, although steamed green beans or broccoli would be just as good. This makes a perfect Sunday night dinner and the leftovers keep well, so they’re great for bringing to work the next day. A vegetarian remake of Salisbury Steak made with lentils, mushrooms, and oats. Combine the lentils and 2 1/4 cups of water in a medium pot. Bring to a boil, then partially cover and reduce to a simmer. Cook for 20-25 minutes, or until lentils are tender, but not mushy. Drain and set aside to cool. Process the oats in the small bowl of a food processor until they’re finely chopped—they should be almost the consistency of flour, but not quite. Transfer to a small bowl. Slice 4 ounces of the mushrooms and set them aside. You’ll use those later for the gravy. Quarter the remaining mushrooms and pulse them in the food processor until finely chopped. Once the lentils have cooled a bit, put them in a large bowl. Use a wooden spoon to mash them a little bit. You don’t want them to be completely mashed; about half of the lentils should still be intact. But mashing them a little bit helps your steaks stick together. Stir in the chopped mushrooms, oats, 1 tablespoon of tamari, ketchup, 1 teaspoon of thyme, Worcestershire sauce, sage, and garlic powder. Season with salt and pepper to taste, then fold in the egg. Form the steak mixture into 8 small patties, about the size of your palm. Place them on the parchment-lined baking sheet. Once you’ve shaped all the patties, put them in the oven and bake them for about 25 minutes, until they’re browned on the outside and hold together. While the steaks are cooking, start the gravy. Heat the olive oil in a large skillet over medium heat. Add the onions and cook for about 3 minutes, until just beginning to soften. Add the mushrooms and cook about 5 minutes more, stirring occasionally, until the mushrooms are browned and have released their juices. Pour in the wine and increase the heat to medium-high. Cook until the wine has just about evaporated, about 2 minutes. Add the remaining tablespoon of tamari, the remaining teaspoon of thyme, and the mushroom or vegetable stock. Once the stock comes to a boil, let the gravy cook down for about 8 minutes, until it’s reduced and thickened slightly, stirring occasionally. Whisk the flour and 2 tablespoons of water in a small bowl. Pour this mixture into the gravy and reduce the heat to low. Simmer for 2-3 minutes, until the gravy has thickened. Remove from heat and season with salt and pepper to taste. The gravy will thicken as it cools. Spoon the gravy over the steaks to serve. I am excited to try this recipe! Can the oats be steel-cut? No, the oats need to be rolled or old-fashioned. These Salisbury steaks were excellent and satisfying. I already has some gravy kicking around so I seasoned like your recipe and added sautéed mushrooms and onions. Excellent recipe! Thanks–I hope you enjoy it! I’m curious what the purpose of adding Oats is? Does it help bind it, or add to the flavor? Thank you for the recipe.Can uncooked steaks be frozen for later use? No, I would cook the steaks, then freeze them vs. freezing them uncooked. You don’t need organic Worcestershire sauce – any Worcestershire will do, but if you’re a strict vegetarian, you’ll want to make sure you’re using a vegetarian brand. It’s a big part of the flavor of this recipe, so I personally wouldn’t leave it out, but it shouldn’t ruin the recipe to skip it. I found mind at Whole Foods. If you have a Whole Foods nearby, ask someone who works there. I think they only had one vegetarian brand at my whole foods. Use A1 steak sauce, Shelly. It tastes better, and it’s vegan. The steaks were yummy & easy. The gravy was the best part! Just wished I had made double the recipe! Is there any way to substitute the wine? I am unable to buy alcohol right now. You can omit it, but the finished dish won’t be as flavorful. Thank you for the recipe! I just have a question about it: when I add mushrooms in the mixer, have they to be raw? Thank you so much for your shares, I always love your recipes so full of flavor and color! These were so good my husband wants them for Thanksgiving entree. Even my mushroom adverse kids ate them right up. Goes to show you if you serve your kids delicious food, they will eat anything. The Worcestershire sauce makes this tasty. Finally made this today, and it was excellent! I had some leftover balsamic reduction but no white wine, so I substituted that and it made it very rich but very delicious. I don’t know why I was drawn to this since I never liked salisbury steak as a kid (not only does it remind me of how much I hated meat as a kid, but it brings back memories of cafeteria food! ), but this was a million times better than the ‘real’ thing! Yum! Nice recipe, very creative – brought out the kid in me! Wife and I modified the recipe to our taste – and we made it for the second time tonight. If you want a real treat with this – cook the onions French onion soup style with Sherry when making the gravy. It takes about 45 minutes prior to adding the mushrooms, but what a treat! What can I use instead of eggs to bind it? Hi Antoinette! You could try mixing about 3 tablespoons of water with 1 tablespoon of ground flax seeds and letting it sit for a few minutes – it should start to gel and take on a texture like an egg white. We haven’t tested the recipe using that variation, so no guarantees, but it’s my go-to vegan egg substitute and it works most of the time. Please let us know how it works if you give it a try! I see that the last message is from over a year ago, so maybe the messages are no longer even monitored, but I decided to make a comment anyway. I am not a vegetarian, but I am trying to eat a bit more vegetables in a more creative way than just having a little dibble dabble of corn or whatever on the side. One way, I suppose is to use veggie burgers prepared in various ways, as I like veggie burgers, at least homemade ones. To that end, I tried this recipe for vegetarian salisbury steak. The first time I made it, I did not have Worcestershire sauce, vegan or otherwise, so I used balsmic vinegar (bottom of the line – Great Value) instead. I also could not find a small enough bottle of white wine, so I just used water. I also was a bit lazy on the gravy and just bought some bottled mushroom gravy and added some sauteed mushrooms to it. I also paired it with some “real” mashed potatoes, and made some homemade frozen dinners, and I think they were pretty good. The second time I made this, I did not make the gravy and just used the patties for “regular” hamburgers. I also pureed the lentils and mushrooms really smooth instead of “course chopping” them. I think I like the coarse chopped version better, but these were pretty good. I made them a third time today, except I used instant mashed potatoes instead of “real” ones, and I had the Worcestershire sauce. I also course chopped the mushroom and just sorta mashed the lentils with a potato stomper, rather than pureeing it to a smooth consistency . I could not wait for dinner to try them, so I had one as an afternoon “snack” (about 3:30) to give it a try, and that turned out pretty good as well. Well anyway, after all that blathering, I wish to say something about the Worcestershire sauce. When I was at the store, there were 3 brands: Lea and Perrins, Annie’s and Krogers. The Lea and Perrins is, of course, made the “traditional” way, with anchovies, so I would have no problem with it, but a vegan or vegetarian would. The Annie’s was vegan/organic, or at least the label had those words printed in great big letters, and it is available at a regular grocery store, or at least at the regular grocery store across the street from my apartment. The Krogers (or store brand) did not list anchovies as an ingredient, so I did some searching and, at least according to the powers that be at Kroger, the sauce does not contain any animal products. I suppose they could be lying about that, but I do not really see any real reason for them to do so. One last thing. A while back, I got some adzuki beans, but don’t really like the “Japanese sweets” made with them, so I found a recipe for making veggie burgers out of them. I will probably split the burgers between using them for regular hamburgers, and the homemade frozen Salisbury steak meals. I’m an extremely picky eater turned vegetarian. I made this recipe sans mushroom (for my own personal preference) and it was really good! My boyfriend who is going on 10 years vegetarian gobbled up three of the steaks in 10 minutes and asked me to make this instead of tofurky for thanksgiving! I did add a bit more white wine to the gravy, as well as a splash of steak sauce and coconut milk creamer. Then I blended it with my immersion blender. Super super delicious!